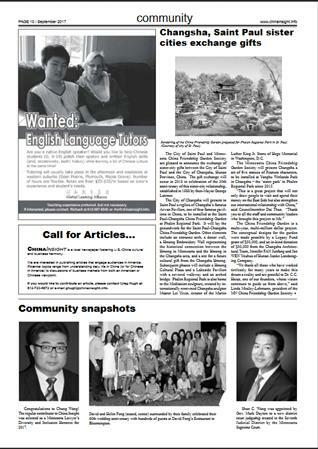 IN THE NEWS – For daily updates, “Follow Us” on Facebook at St. Paul-Changsha China Friendship Garden at Phalen Park. Click here. 2018 Nov-Dec “St. 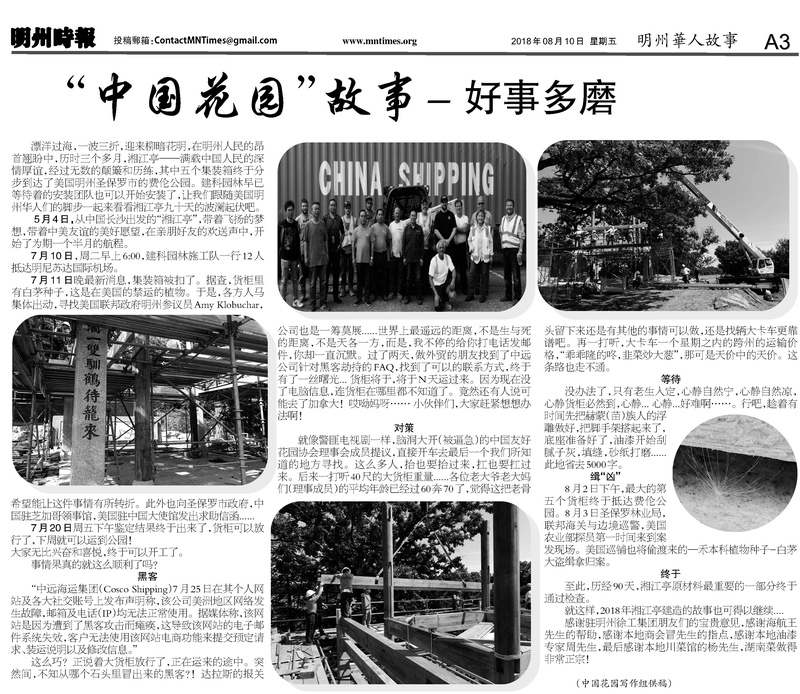 Paul-Changsha China Friendship Garden Progress Update” in China Insight. Read here. 2018-11 中國4大名亭之一「愛晚亭」 明州聖保羅市重現 in World Journal. Read here. 2018-11[明州报道】停车坐爱枫林晚 – 中国友好花园“柳明园”的湘江亭落成开放! in 州华人世界. Read here. 2018-11[走近明州】初摄湘江亭印象 in 州华人世界. Read here. 2018-11-3 Chinese Pavilion, Gift from a Sister City, Unveiled at Phalen Regional Park, in Pioneer Press. Read here. 2018-10-31 U.S. State of Minnesota to Open Chinese Garden, in Xinhua Net. Read here. 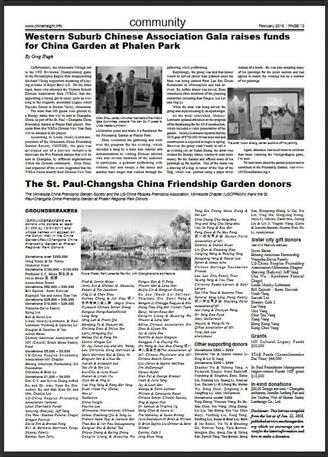 2018-10-31 St. Paul-Changsha China Friendship Garden to Host Open House, in Woodbury Bulletin. Read here. 2018-10-25 ““湘江亭”11月3日将迎来第一个开放参观日” in 明州华人世界. Read here. 2018-10-25 “你好, 湘江亭!” in MICS明州国际. Read here. 2018-9-26 Speech by Chen Zhou at UCA (United Chinese American) Gala. Read here. 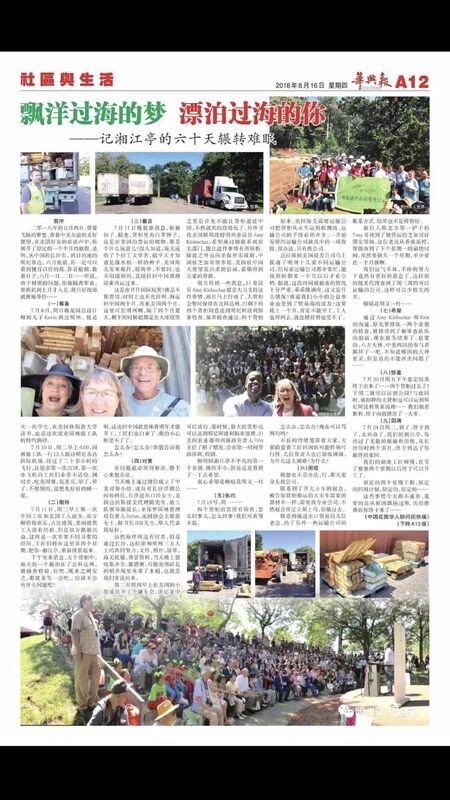 2018-9 “Sister-City Gift from St. Paul arrives at Changsha’s Yanghu Wetlands Park” 洋湖湿地公园赠予的湘江亭 正式 落户 美国圣保罗市 费棱 公园. Read here. 2018-9 “Groundbreaking Ceremony for St. Paul-Changsha China Friendship Garden at Dragon Festival,” China Insight. Read here. 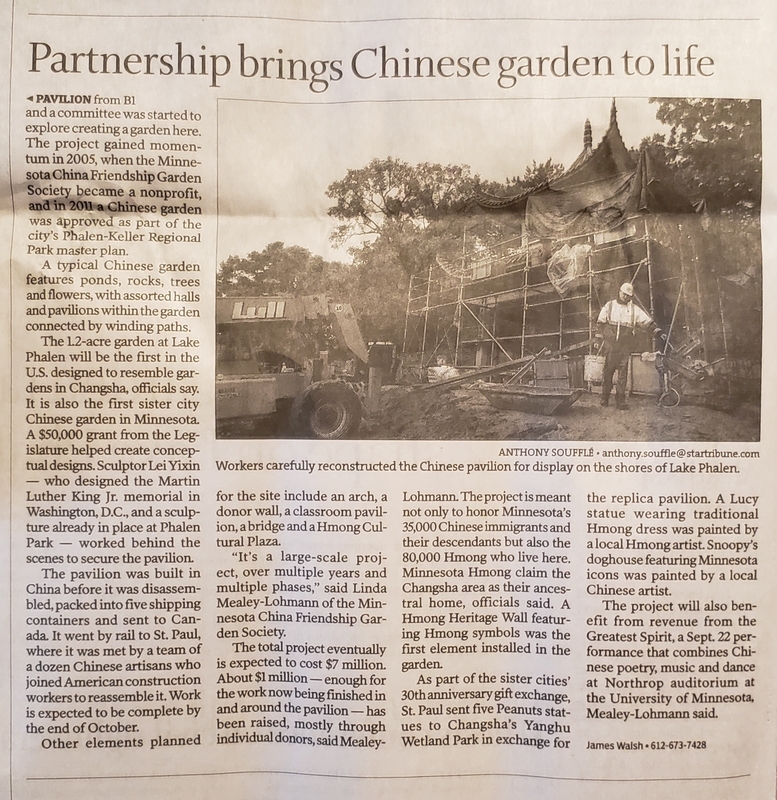 2018-9-4 “Friendship Garden Taking Shape on Lake Phalen,” Star Tribune. Read page 1. Read page 2. 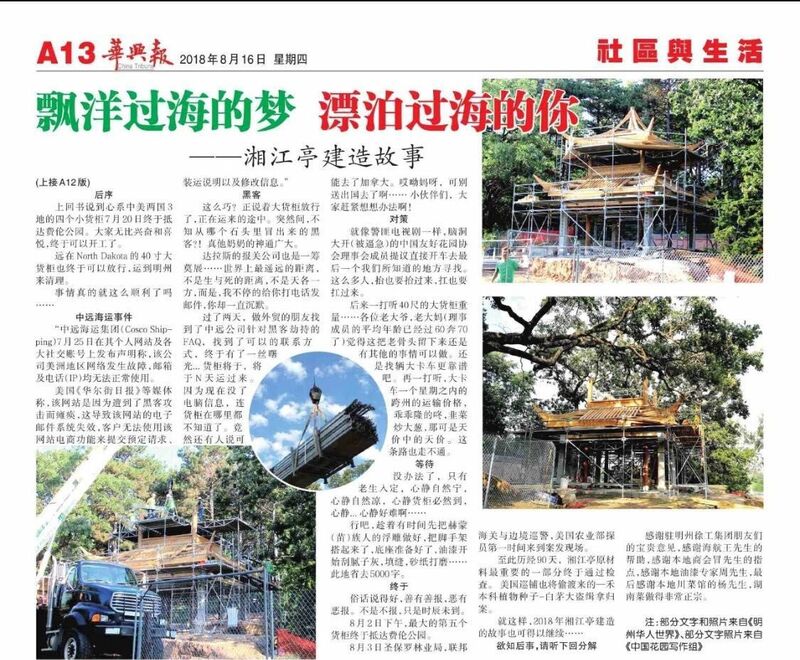 2018-8-20/24 China Tribune Article – “China Garden Dream.” Read Part 1. Read Part 2. 2018-8-16 China Tribune article. Read page 1. Read page 2. 2018-7-14 Speech by Mayor Melvin Carter at Groundbreaking Event. Read here. 2018-7-14 Speech by Linda Mealey-Lohmann at Groundbreaking Event. Read here. 2018-7-14 Speech by Senator Foung Hawj at Groundbreaking Event. Read here. 2018-7-14 Speech by Chen Zhou at Groundbreaking Event. Read here. Congratulations letter from US Senator Amy Klobuchar. Read here. Congratulations letter from Chicago Chinese Consul General Hong Lei. In English. In Chinese. 友城互动 | 刘军副总领事出席明尼苏达中国友好花园协会活动 “Chinese Deputy Consul General Liu Jun attends MN China Friendship Garden Society Event,” March 29, 2018. Read more…. KSTP.COM “Fundraising Underway for 1st China Garden in Minnesota,” by Reporter Jennie Lissarrague, August 15, 2016 Read More…. MN Public Radio Audio Story, “Garden Proposal United St. Paul with Chinese Sister City,” by Reporter Amanda Furru, August 9, 2016 Listen Here…. 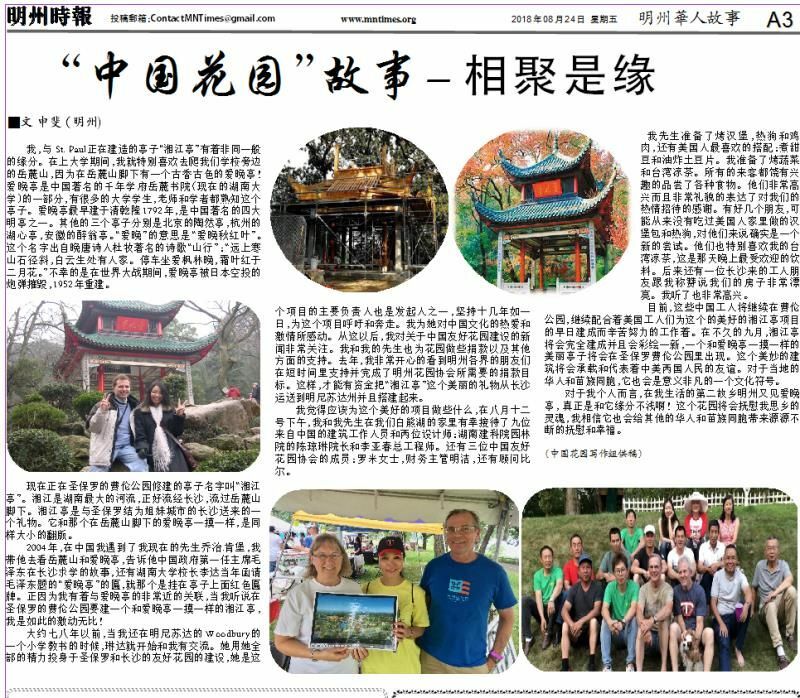 St. Paul Mayor Coleman and members of MN China Friendship Garden travel to sister-city Changsha in October 2015 Read More…. Lake Phalen Chinese garden boosters seeks support – TwinCities.com.